Quick drying no mess formula, perfect for enthusiasts and pros! Works great with the DI Horse's Hair Upholstery Brush or the DI Carpet Scrub Brush. 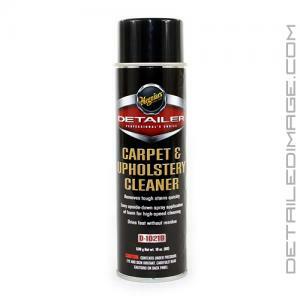 Meguiar's Carpet & Upholstery Cleaner will help remove dirt, oil, and stains from your carpet and upholstery with ease! This products unique upside-down spray application allows you to use it at angle with more control so you apply the cleaner exactly where you want it. The rapid foaming formula quickly lifts away dirt and stains, while drying extremely fast without leaving behind a sticky residue. 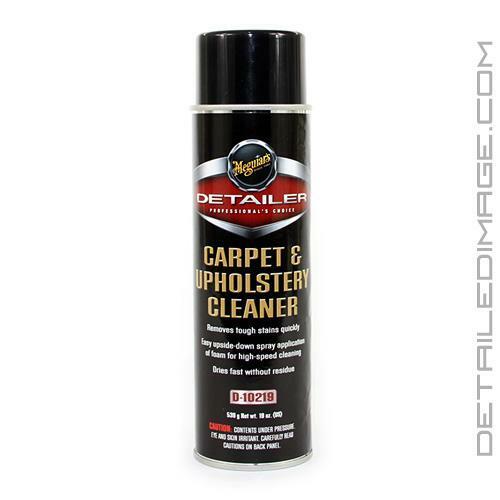 Since the formula dries rapidly it is the perfect product for professional detailers! The solution is so versatile that it can also be used to clean vinyl, colored plastic, and rubber as well! If you are looking for a fast drying and extremely effective interior cleaner then the Meguiar's Carpet & Upholstery Cleaner is for you! Made for high volume detail operations, this aerosolized cleaner speeds up the cleaning and drying process on fabric surfaces. The upside-down spray application of foam provides an excellent angle and more control to apply product just where you want it. Foaming formula quickly lifts out dirt and stains for fast drying without a sticky residue. This versatile cleaner can also be used as a rapid interior cleaner for most surfaces...vinyl, non-clear plastic, and rubber...in addition to carpet and upholstery. Note: Before using, test for colorfastness on small, inconspicuous area. Directions: Vacuum carpet and upholstery first. Shake well. While holding can upside down, spray a small amount onto desired surface from a distance of 6 to 8 inches. Using a Meguiar's Ultra Plush Super Terry Towel, a Meguiar's All Surface Interior Brush, or a clean, 100% cotton, terry cloth towel, gently work the product into the surface. Use a terry cloth towel to a clean portion, until surface is dry to the touch. Spray carpet and cloth seat stains let it sit for 3 to 5 minutes. Take a damp warm cloth and stains will disappear. Have used in my shop the last 5 years and it works like it says if you follow directions.